Irrespective of the time and money you invest in your lawn, without proper tools and nutrients, you cannot expect great results. Aeration is important for any kind of plant and grass growth, so to solve that issue, having the lawn aerators for your tight compacted soil is a great decision. Here you will get the best lawn aerators for sale which you can go through to select the best one. With a promise of refined results and durability, we have put a lot of research in the narrowing down process. You can be pretty sure of any model you decide from this list. Have a look at them for more information. Enhancing the beauty and appeal of your lawn is a much easier job if you have the right equipment. Having a lawn aerator tool means reducing runoff issues can be handled with ease, thereby the turn will look plush and well grown always. 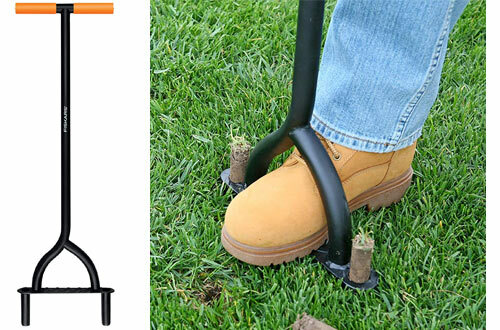 The excellent design behind the aerator helps in loosening of soil and improves air penetration. In other words, it allows more air and water can reach the roots. 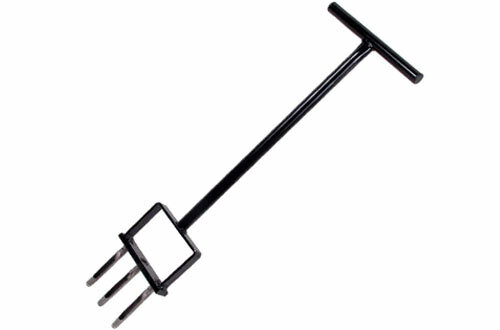 With the use of this lawn aerator, root growth gets better and resistance to drought also improves. Comes with 37 inches of height to reduce stress while working. Designed with a foot bar for the convenience of working. Designed to make things easier at your lawn, with a heavy-duty lawn aerator at your disposal, more efficient use of water and fertilizers can be achieved every single time. 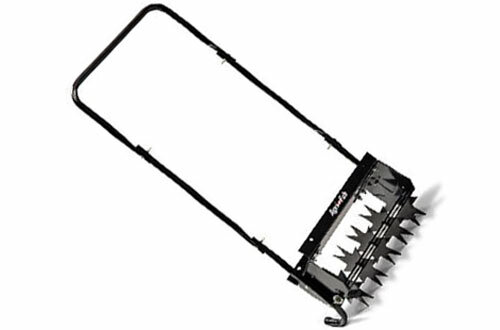 This aerator comes fitted with four numbers of hardened spikes which helps in loosening of compact soil well. These spikes are each of 3” length. Hence, they go much deeper and help water to reach up to the roots well. 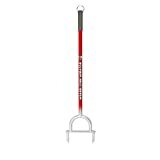 Standing at a height of 36-inches, handling of the tool is as easy as you would like. Escalates the penetration of water and fertilizers down to the roots. Also, it helps in separation of roots. The smartly designed aerator for lawn has an unlikely wheel spike set-up that aids in easier and effortless movement of the aerator. 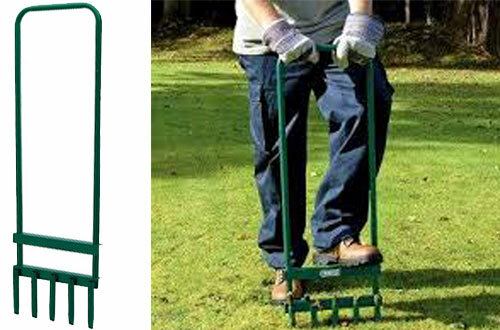 Suited for huge areas, this walk-behind aerator can be handled with ease and comfort. The 5 wheels have 7” inches of spike length on each. Hence, it guarantees deeper penetration in any given scenario. An aeration depth of 2-2.5” can be achieved with the application of this aerator. Of course, it has a steel weight tray to accommodate any concrete block. As a result, it ensures the spikes dig deeper always. 16-inches of width cover a larger area as it moves. The soil in your lawn is the primary aspect that ensures beauty. For proper maintenance of the same, you need to adapt to the correct methodology and using a lawn aerator helps you in getting there. Oxygen and water along with all the nutrients reach the roots much more efficiently with proper penetration. The multi-spike design of this model makes sure the hardest of the soil surface gets well penetrated always. One piece of powder coated metal construction for top-notch durability. Designed with five spikes for obtaining the best of results. 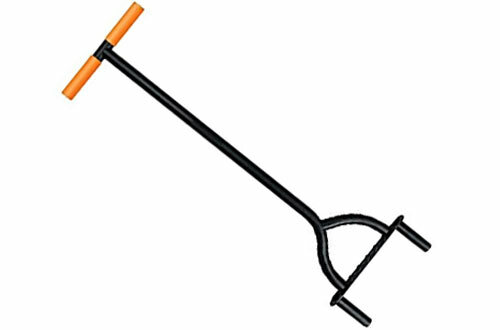 Havehollow tines which help in soil removal without cause any adverse effects. No matter how much time and money you invest behind your lawn, the rough patches and poor grass quality persists and makes the lawn look very unappealing. When a lawn aerator is used for that purpose, the nutrients and water actually overcome the boundary of compacted soil and reaches the root level. Of course, regular use of this can gift you with astounding results and elevates the overall beauty of your lawn by quite a margin. The weather, as well as rustproof construction, makes it an ideal all weather product. Carbon steel built will be at your service for a very long time. Has a footplate that allows the right pressure to be applied. Grip handle improves the convenience of moving it around. Soil will get benefitted with an abundance of nutrients, water etc. Keep your lawn healthy like your health by providing it with the sufficient nutrients and making sure the nutrients get to the deepest end. With this rolling lawn aerator, perfect perforation of the soil surface is guaranteed; thereby making sure sunlight, oxygen, nutrients and water reach the roots. As a matter of fact, the two-wheeled design aerator is equipped with tine spikes for easier penetration while you are moving. 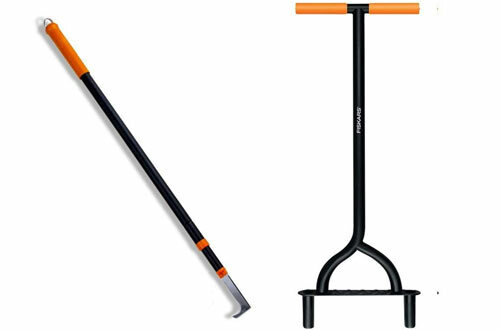 Most importantly, it has a very smooth as well as a steady frame for hassle-free using in your garden. The 50-inches handle for comfortable handling. A sturdy steel construction adds life to the aerator. Plastic wheels assure a tension-free operation cause there is no danger of puncture and damage. Obviously, it is very important to keep the right machine and tools that can be beneficial when you are focused on beautifying the looks of your lawn. Apart from continuous maintaining, aeration plays a major role in elevating the soil and grass health. 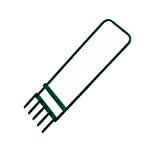 Obviously, with this aerator, you will be able to get it done without causing much trouble to your time or money. 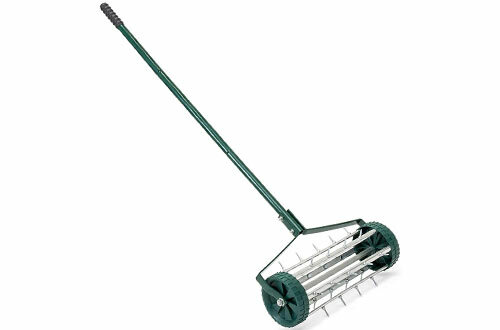 Perfectly designed and constructed, the 38” long aerator can be used on any given area without causing health hazards. Furthermore, this is capable of removing 4” core. Importantly, it features a big step so that you can provide the required pressure and power. Unrivalled strength and stable steel shaft aim to provide a fine operation. This law aerator has overall welded steel built to keep away damage. 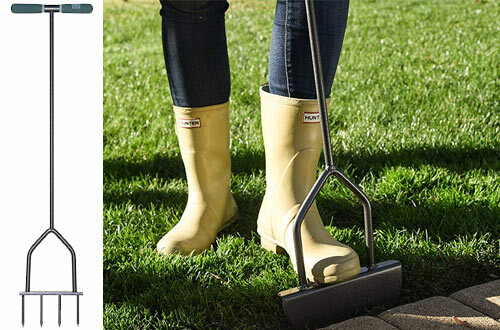 One of the most reliable lawn aerators in the market, the Rittenhouse is a perfect example of strength and stability blended with supreme functionality. Attributing to the all steel build, no matter how much intensifying your working is, the aerator will keep on serving you for long. Such an upgraded design makes it a suitable choice for both your personal lawn or for a professional need. Appropriate size for places that cannot fit in a full-size aerator. Steel tines are can be detached and replaced when needed. Rugged and long-lasting frame guarantees long life and heavy-duty application. You know that you have made a wise choice when you get the benefit of two important equipment in one package. 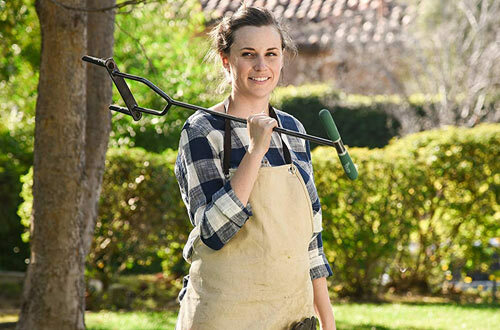 With this aerator, now you can also have a deck flosser to redefine your lawn even more and make it amazingly appealing for everyone who comes to see it. Further, the advancement in the design of the flosser gives it the ability to expand from 38” to 62” and meet your need the best way. Two prong convenience of the aerator makes working easy and effective. Welded steel construction to eliminate breaking risks. Of course, a deserving spot on the list, yet another Rittenhouse product makes the mark owing to the supreme construction and design it has. The two-prong frame delivers an effective penetrating power. Plus, being sharp and crafted of steel, you can always be sure of your results. Therefore, the welded steel frame is also safe against breaking issues in the long run. 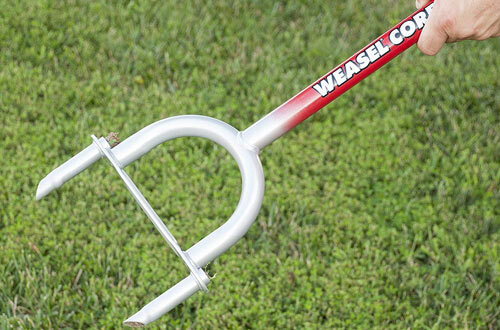 Furthermore, this has an ideal 38” length for the needed purpose. The T-handle is padded for extra comfortable holding and firm grip while using. Also, the foot platform is large, thus maximum pressure can be applied. For creating a lovely impression amongst the guests, keep your lawn at its best condition by getting the best manual lawn aerator. This tool from Vertex is slightly more expensive than most standard models, but makes up for that fact with its smart design and durable build. The contoured forward handle design centers your weight better and allows you to balance over the foot rest easier. This specific build conforms to your body’s natural comfort zone better, and the aeration process helps create healthier lawn that is less water and fertilizer hungry. 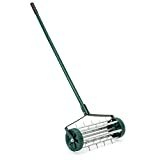 Alterra Tools Garden Lawn Aerators – Coming in a unique package, this spike aerator from Alterra Tools offers some similarities to other models, as well as other more interesting departures. Instead of offering a linear line of spikes, it uses 4 square-aligned diamond blades. You can use the large stepper to increase the driving force into the soil. One of the main advantages of this style of blade is that it has superior soil penetration, due to the increased surface to soil contact. The ergonomic cushioned grip is comfortable to use and support.